The ski condition keyword from Whiteface Mountain is "delightful!" The first-hand report on the cross-country ski conditions at Mount Van Hoevenberg is also delightful! The Jackrabbit trail is in good condition, with conditions improving every day. We've received about six inches of freshies in the last 24 hours, and more snow and cold conditions are on the way. 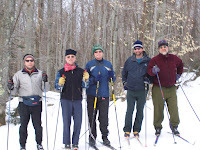 Skiing's great in New York State - especially in the Adirondacks! An important part of the Adirondack Lifestyle is the long history of healing in the Adirondacks. As long ago as the 1800s, people have been coming to the Adirondack Mountains of upstate New York to get better or maintain health and wellness. For example, The Trudeau Institute, in Saranac Lake, is one of our hidden jewels. The Trudeau Institute was founded in 1884 as a tuberculosis treatment and research facility. As new drugs became available in the 1950's to treat the disease, the Institute was rededicated in 1964 as an independent nonprofit organization committed to world-class medical research. Today, renowned scientists from around the world work at the Trudeau Institute to better understand the immune system for the purpose of preventing and treating human disease. The Trudeau Institute also hosts a wonderful summer student intern program for North Country high school seniors. My son participated in the program which was one of the highlights of his high school career. Here is some historical information about the Trudeau Institute.